We got too big for our britches! The Oxford Kinetics Festival has outgrown its infrastructure. We are taking 2017 off to regroup and rebuild. We will be back in 2018 renewed, refreshed, bigger, and better. When we have dates, and details we will post them here. In the meantime, keep creating and being an innovative force in the world, we'll do our best to do the same. See you next year! Our 2016 poster by the always amazing Tom Duvall of Wire & Twine. The Scramble is part parade, part race, part obstacle course and all fun. Participants will self-power their mobile creations along a course which circles and criss-crosses itself. You will also need to be able to pilot your contraption effectively enough to avoid other moving contraptions. Who participates? Anyone under the age of 18 or family teams. Entries range from pedal powered hovercrafts to your brother’s razor scooter decorated with water wings, from monster bicycles to giant puppets on stilts. Think welding, papier mache, face paint, foam rubber, cake and biscuits, rubber bands, and flubber. Go for it! Find registration information on the race page. As always there will be a bike decorating station at the festival for last minute upgrades to your ride, but why not take advantage of the making workshops held in March and April to make a truly original entry. Learn more on the workshop page. For racers and kinetics artists 16 and over, The Dog's Breakfast!! This is a scavenger hunt of a race sending you on a quest around the Millett grounds. The Dog's Breakfast will begin at 12:30 on Sunday but you must pre-register on the race page. Sign-in starts at 12:00. 2016 will feature awesome workshops prior to the festival. Check out the workshop page to see the selection and reserve you space soon. Regional artist Jesse Mooney Bullock will perform his show, "Luigi Bullooney's Circus Menagerie" at this year's festival. Jesse's work combines art and engineering and performance in a way that we love. Learn more about Jesse and his amazing hand-carved puppets at his website jessemooneybullock.com. Jesse will be available after the show to discuss his work. Come check out all the awesome STEAM (STEM + Art), art, science, and just amazing activities going on throughout the day. There will be music, puppets, performances of all description. 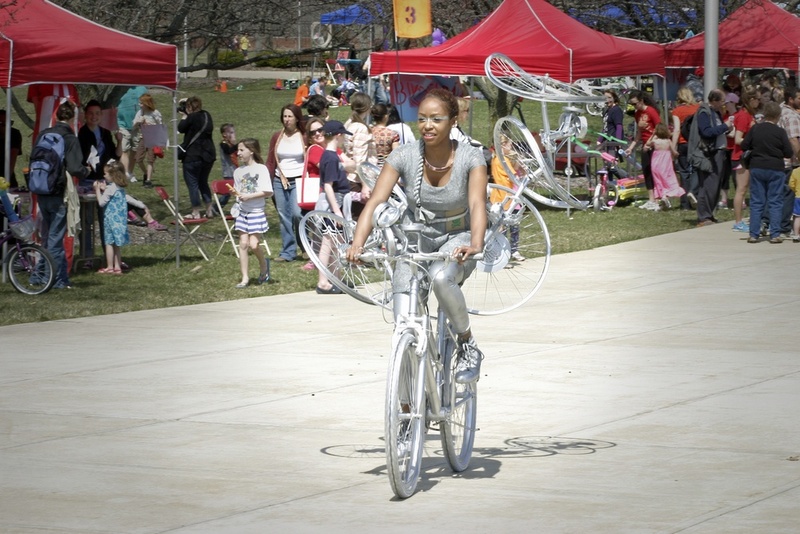 Stilt bars, side show freaks, fender blenders and whirlygigs. Happen Inc. will be on the scene with amazing toy ideas for you to create and enjoy.Try your hand at modifying and launching an air powered rocket made from re-purposed soda bottles. See if you can get your rocket to go higher than your friends’. Try to wrap your brain around what Rube Goldberg is all about and use our stuff to build and explore nonsense contraptions for the day. You can donate to keep our gears moving for the 2016 OKF! We are delighted to be partners in this effort with the Oxford Community Arts Center, www.oxarts.org. They work tirelessly to promote the arts and offer a permanent home for the arts in the Oxford community. Artswave has again given a generous project grant to support the 2015 Oxford Kinetics Festival. We are proud to have their support for our projects and so grateful to the many donors who give to Artswave each year. The Miami University Family Fund (formerly the MU Parents Fund) has supported the programming at the festival that involves Miami students and the community generously for the past three years. Thank you! A quick shout-out and a big thank you to the Miami-Talawanda Partnership. Your support for the 2014 and 2015 festivals has been awesome! We are excited to welcome Happen Inc. once again to the 2015 festival by bringing numerous fun, educational and creativity inspiring activities to Oxford for the day. Happen brings so many of the wonderful activities we have for kids each year. You can learn more about their many exciting projects and see examples from past Toy Lab participants at www.happeninc.org and www.happeninc.org/toylab . Thanks to the Butler County Rural Electric Cooperative Community Connections program for a grant in support of the making workshops that take place every Saturday in March leading up to the festival. These workshops allow members of the community to get building and design help from artists, mechanics, and manufacturers. Thanks for being there for the community BCREC! We received a generous award from the Efroymson Family Fund for promotion of the 2014 festival. Thank you for supporting cultural tourism in the midwest and the arts in Indiana and beyond! In 2014 we received a project grant from the Ohio Arts Council. This grant was made possible with funds from the National Endowment for the Arts. We are so thankful that such organizations exist to promote the arts in our communities and grateful for their support of the Oxford Kinetics Festival.